use code "NPSLAUNCH" on your first purchase! Celebrating the launch of the new Nippon Paint Singapore Online Store, enjoy FREE SHIPPING and 5% OFF your cart! *Paint calculations are all based on a 240 sqft sized room (HDB Bedroom). Blue has always been associated with masculinity and soothing effect to people. 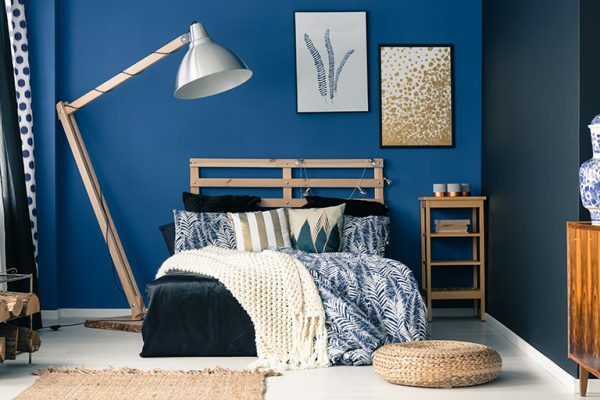 By pairing with light wooden furnishing, the room will look dashing without a hint of depression that most people asssociate dark blues to. Earthy greens make a comeback as a means for people to be in touch with the basics - Mother Nature. It gives a calming effect to the space without any shout for attention. Best for home offices and bedrooms. Have a small wall that you are unsure what to do with? Try giving it vertical lines to create the visual perception of a higher ceiling! Gold and purple are not the only regal colours! Bring in the deep red wine colour to match with your wooden furnishing pieces.